Arguably the most difficult norms to set are those pertaining to the appropriate care and management of the patient. Using audit processes not only allows for assessment against defined norms and standards, but also helps to define and refine the norms and standards themselves. Audit ‘compares what is with what ought to be’ and measures appropriate healthcare management, performance and care. We previously discussed death audits/reviews, which focus on a specific incident and on the factors that contributed to that death. Other types of audit include clinical or facility audits which may be undertaken in response to an incident or as part of a routine monitoring process. For clinical audits the ‘norms’ and standards are usually set by referencing evidence based guidelines whilst also using the collated knowledge and agreement about best practice of those undertaking the audit. This is likely to be a subjective process, but audits are a traditional way of comparing practices against accepted clinical standards in a qualitative manner. There have been developments of audit approaches to make quantifiable comparisons against standards as we shall see next. 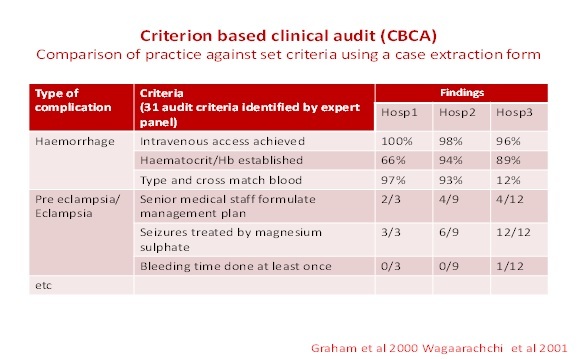 Criterion based clinical audit is a way to quantify whether norms or standards have been met. In this case the measurement of quality against standards is done by identifying a certain number of actions (criteria) that should be done for all women suffering an obstetric complication; so that the ‘standard’ is that all cases of specific complications should receive 100% of pre specified interventions. A sample of the criterion and scoring mechanism is provided in Figure 4.3 below. Apart from using CBCA as a means to compare against set criteria, it can also be used to monitor performance trends over time and to compare the performance of different health facilities or practitioners with each other in a form of benchmarking. A pre-defined norm is not set, but the comparison allows a relative assessment of identifying ‘high’ and ‘poor’ performers. 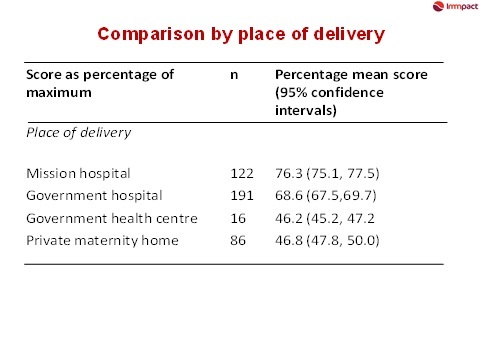 Figure 4.4 below shows data from a study in Sub-Saharan Africa where data on various care processes related to childbirth was collected from different types of health facilities. The findings suggested that more criteria were fulfilled in mission hospitals that other types of health facilities. There are many other tools used in quality improvement that aim to compare quality processes against norms and standards. Safety checklists originated outside the health arena and have been used in industry and airline safety for many years. 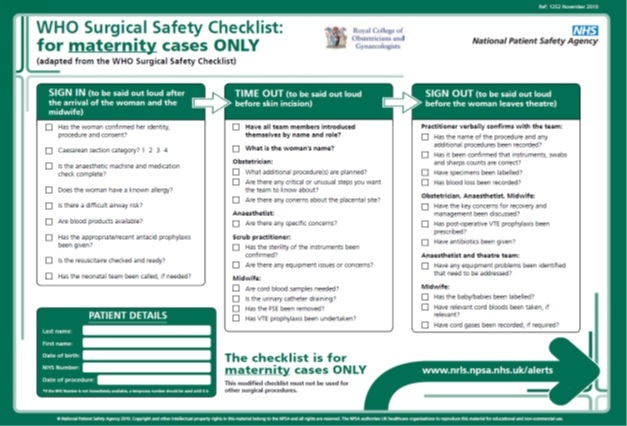 Subsequent to successful use in surgical care, checklists have been introduced in maternity care by the World Health Organization. The checklist assesses safety aspects against norms, identifying essential actions that must be done at critical points when providing patient care. These checklists are currently being field tested in a number of low and middle income countries. 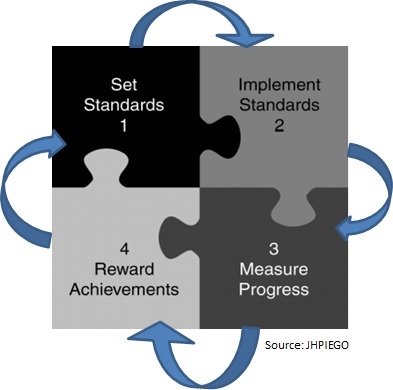 The approach describes how norms and standards can be set, implemented and measured (see Figure 4.6 below). A key advantage of this approach, which is not well covered in the other tools described, is that the concept of quality improvement explicitly recognises support functions (e.g. management and organisational structure) and strategic functions (e.g. leadership and partnerships) as well as the core service and care functions.